iPhones have a lot of functionalities and charms of its own that it finds a lot of users. But most of these are often done with the help of internet. Starting from the personal assistant Siri, everything works smooth with the web. So it might bug you if your phone has some connection issues. Most often, your iPhone won’t connect to WiFi even if there is a WiFi network available. The WiFi button may appear to be grayed out or doesn’t connect even if you try connecting. Or the problem could be that every device except your phone gets connected to the network or none of them connect at all. 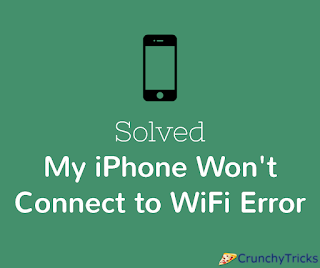 Whatever be the issue, you will find solutions to Fix "My iPhone won’t connect to WiFi" Error here. Now this is the simplest solution that anyone should try if they can’t successfully log in to the WiFi. Try putting your phone in Flight Mode and then turn Flight Mode off. Try restarting your iPhone by turning it off using the Power button. Give it some time to turn off and then press and hold the Power button again to turn it on. Probably after waiting for 20-30 seconds, your connection error may be rectified. If no device is getting connected to WiFi, the problem is with the router. Make sure that your router is working correctly and try turning it off and on. Tap on Settings, the gear icon in your iPhone menu. Tap General followed by Reset. Tap on Settings>General>Reset>Reset all Settings. Reset option will erase all the password details so you will have to enter the WiFi password and a few other details if needed. Resetting network settings may not work at times. Resetting all the settings is too much to ask for as you will lose all your preferences at once. So it is better that you forget the network and join again. This can be done easily. Tap on Settings. Select WiFi. The available channels will be shown and choose the network. Tap on Forget this network option. The WiFi network will be disconnected. You can join again to this network manually. Open Settings and choose the WiFi network. Select the option Static instead of DHCP. Give the values in the columns. Usually, a DNS address like 8.8.8.8 will work if your network provider has not given you the router configuration before. So try using it. If a new update is needed, it will be shown. After updating your phone, connect to the WiFi. These are the little tweaks you can try on your phone to fix the error. But every phone is different and might be dealing with a different problem which might be preventing a WiFi connection. If nothing works, try contacting the Apple Support Team to get your issue resolved. Even if these methods don’t fix your issue completely, you will at least know whether the problem is with the phone or the router so that you can bring it to the attention of experts. Hope it helps.